How old is this calculator ? How much is this calculator worth ? Where can I buy/sell old calculators ? Where can I find out more about this calculator ? Where can I get an operating manual ? How can I get this calculator repaired ? How do I operate a Pin-Wheel Calculator and a Comptometer ? Why do calculator keypads have the numbers in a different order to telephone keypads ? Using certain visible features it is possible to estimate the age of a calculator by looking at it. Estimating the age of a Mechanical Calculator. Estimating the age of an Electronic Calculator. Estimating the age of a Hand-held Electonic Calculator. Date codes on Electronic Components and Circuit Boards. If it has polished brass covers it is likely to date from the late 19th century to the early 20th century. But beware: if the paintwork on a calculator is in poor condition then it may get stripped off to reveal brass underneath. I have been caught like this with a 1950s pin-wheel calculator which with its brass finish looked very smart, old, and a good bargain. However later examination revealed its true age, and in this condition little value. If it is painted black it is likely to be pre-1940 (except the Curta). If the paint is of the "crackle" type (looks wizened) it is likely to be 1950s to early 1960s. If the paint is of a light colour it is likely to be mid 1950s to early 1970s. If it has a light coloured plastic casing then it is likely to be 1950s to early 1970s. It has a "full" keyboard (see Anita Mk VII). It has a cathode ray tube display. The display uses a separate tube for each digit, especially if the calculator displays more than 8 digits. It is very large and heavy yet only has the four basic functions (addition, subtraction, multiplication, and division). The position of the decimal point has to be set manually using a rotary switch. If the circuit board(s) inside have dozens of components, or have several large integrated circuits. There may be lethal voltages - unplug from the AC outlet and remove any batteries before removing covers. Components will be damaged by electrostatic discharge. Look for date codes on the electronics components, see below. The display uses a separate tube for each digit. The calculator is large, very thick, and heavy, and only has the basic four functions (addition, subtraction, multiplication, and division). The charger to recharge the batteries plugs into the calculator using a strange plug and socket, often with three pins. If the circuit board(s) inside have several large integrated circuits. There may be lethal voltages - unplug any charger from the calculator or remove replaceable batteries before attempting to remove covers. Do not force anything - some calculators cannot be opened without damaging them !! Components will be damaged by electrostatic discharge. Most integrated circuits and some other electronics components are stamped with a date code when they are manufactured. 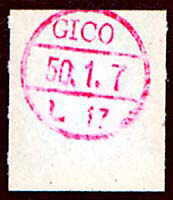 These are often of the form 7326 or 2673, where both of these indicate week 26 of 1973. If components have not been replaced then the calculator cannot be older than the latest date code on any component and is likely to be somewhat newer. It is in a high grade, expensive, ceramic package. It is in a socket, which is expensive. There are 5 integrated circuits on the board, and they are expensive. If any of them fails, instead of scrapping the whole board, it can be easily removed from its socket and be replaced. 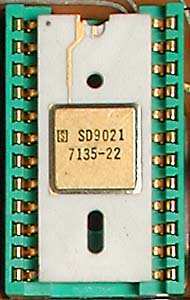 Circuit boards sometimes carry a date stamp, often incorporated with an inspection stamp. With luck the date will be spelled out, but sometimes the date is not so obvious, as in the stamp shown on the left on the circuit board of a Commodore 784D hand-held calculator. Some calculators have patent numbers printed on them. Below are lists of the first patent numbers issued in the given years. The calculator cannot be older than the date of the latest patent. * GB patents were reorganised on Jan 1st 1916 starting at No. 100,001. To put it simply - A calculator is worth what someone is prepared to pay for it. Is rare - But rareity is not everything, since the model may not be highly desirable, see below. Is highly desirable - Certain companies, such as Hewlett-Packard and Sinclair, have a charisma for various reasons which adds to the desirability of their calculators. Certain models also have a charisma since they were historically significant and most collectors want one of their collection, such as the Hewlett-Packard HP-65, which was the first hand-held programmable calculator. Is in excellent cosmetic condition - Scratches, cracks, dents, dings, rust, stains all markedly reduce the value. Is complete with operating instructions, box, and other accessories. Does not have high shipping costs - Some mechanical calculators are very heavy which may mean that the shipping cost is more than the calculator is worth. So what is this calculator worth ? Estimated values of many hand-held electronic calculators are given in "The Complete Collector's Guide to Pocket Calculators" by Guy Ball and Bruce Flamm - This has proved to be of great use, but is getting dated now and experience has shown that it may place too much emphasis on rarity and not enough on desirability. Similarly, estimated values for mechanical calculators are given in "Antique Office Machines: 600 Years of Calculating Devices" by Thomas A. Russo. Both of these books give the value of calculators for someone in the U.S.A. and this may be quite different for someone in another country where a certain model may be more or less common. To really find out what people are prepared to pay for a calculator find out the highest bids for that model at auction. The world-wide trading place for calculators, old and new, is the eBay auction site - main site at www.ebay.com, but see the "Where can I buy/sell old calculators?" section below. Search on the model that you are interested in and see the highest bids reached, and see how this depends on its condition and accessories included. For rarer models you may have to search over some time before one comes up for sale. Each eBay auction has an item number, on the right just below the header information. You can then search on the item number to get the result of an auction for a few weeks after the auction end. The more valuable mechanical calculators can also be found at other auction houses, especially in sales of antique scientific instruments. The final bid may be low if collectors really interested in that model have not noticed that it is on auction. The final bid may be high if two or more collectors are desperate to obtain that model. The final bid may be low if several similar models have been auctioned recently and collectors prepared to pay a lot have already obtained that model. On eBay the final bid may be low if the seller has a poor feedback profile which puts off bidders. Searching out old calculators can be an exciting but frustrating experience. Although good bargains can be found in flea markets, thrift stores/secondhand shops, and garage sales/carboot sales, the success rate of finding anything interesting can be very low. Mechanical calculators, and a few electronic calculators, can turn up at antiques and collectors fairs, though prices are generally higher and bargains are fewer. The market for old calculators has been revolutionised in the last few years with the founding of the eBay internet auction site. At any one time there are dozens of old calculators being auctioned from many countries, with many bargains and some very fierce bidding for the rarer and more desirable models. It is a useful place for obtaining calculators which are common in other countries but not where you live. The main eBay auction site is in the U.S.A. at www.ebay.com. As a starting point just search on calculator and go through the long list of calculators, old and new, on auction. There are other eBay sites in other countries, such as www.ebay.co.uk, though everything can be accessed from the main site by using the Advanced Search, and don't forget that the word for "calculator" may be different in other languages. Before buying or selling through eBay for the first time you are advised to study the auction process and follow some auctions to understand the process. One of the most important aspects of eBay is the trust between buyer and seller, which can be assessed from their feedback profiles. International payment has been made very convenient by services such as provided by PayPal. Calculators are sometimes sold and requested through the Old Calculator Forum. Search This Site - Use this search engine to search everything on this site. If you cannot find any details on this site try a web search using the Google search engine. Curta - at "Curta.Org: Your Complete Curta Calculator Site". Olivetti - Jay Respler who worked for Olivetti and is now an Olivetti dealer has offered to field queries about Olivetti calculators, you can reach him at JRespler@superlink.net. Texas Instruments - at http://www.datamath.org/. The calculator may be mentioned in a calculator book - see Calculator Books. If all this fails to provide information then you could try asking on one of the calculator forums - see Calculator Forums. Study the section on this site about identifying the type of the display of a calculator. Operating manuals often get lost and can be a rarity, so are worth paying extra for. Katie Wassermann has a growing list of manuals for electronic calculators, which are downloadable in pdf format, at http://www.wass.net/manuals/. There are operating manuals in pdf format for the Curta calculator and a number of other mechanical and electronic calculators at http://www.curtamania.com/curta/code/download.html. There are manuals for older Hewlett Packard calculators downloadable in pdf format at http://www.hpmuseum.org/. Joerg Warner has many manuals for Texas Intrsuments calculators at his Datamath website at http://www.datamath.org/Manuals.htm. If you desparately need an operating manual for a mechanical calculator see if it is available at Office Machine Americana. Note that on this site that there are the basic operating instructions for pin-wheel calculators at Operating a Pin-wheel Calculator and Comptometer-type machines at Operating a Comptometer. Jay Respler may be able to supply a manual for your Olivetti calculator, you can reach him at JRespler@superlink.net. John Wolff can provide copies of calculator manuals and some service manuals. For details visit his Web Museum at http://www.johnwolff.id.au/calculators/Tech/Manuals.htm. For instructions on using Addiator-type (stylus) machines see http://www.mechrech.info/anleit/addengl.pdf. Have a look at the Links to Youtube Videos page, or search www.Youtube.com itself, to see if there is a video of that calculator, or a similar one, in use. Otherwise, try asking at one of the calculator forums such as the Old Calculator Forum. Someone may be able to send a photocopy or scanned images. This can be a problem. There must still be many retired repairmen about who would be prepared to repair old mechanical calculators, but there is no list of them and shipping costs could be expensive. With old electronic calculators it can be difficult to source long-obsolete electronic components. If you need to have a Hewlett Packard calculator repaired you may be more lucky. Have a look on the Hewlett Packard Calculator Museum site at http://www.hpmuseum.org/repair.htm. Jay Respler who worked for Olivetti and is now an Olivetti dealer may be able to help you out with repairs to your Olivetti calculator, you can reach him at JRespler@superlink.net. The lubricants of mechanical calculators harden over time causing the machine to become jammed up and require servicing. The proper servicing of a mechanical calculator is not for the faint-hearted. If you are prepared to have a go yourself, John Wolff has detailed general information on how to go about it in the article "Notes on Overhauling a Mechanical Calculator" on his excellent website. John's final advice there is to exercise a mechanical calculator regularly and to periodically lightly lubricate it to prevent it from seizing up. There used to be a few repair manuals for mechanical calculators available at Office Machine Americana though this site appear to be inactive now, otherwise, try asking at one of the calculator forums such as the Old Calculator Forum. Someone may be able to send a photocopy or scanned images. For basic instructions on operating a pinwheel calculator have a look at the article on this site "Instructions for basic arithmetic operations with a rotary pinwheel calculator". For instructions on performing addition, subtraction, multiplication, and division on a "Comptometer" type calculator have a look at the article on this site "Operating a Comptometer". How do I operate this electronic calculator which has a strange keyboard? Some calculators such as the Sharp EL-8 and Bowmar 901B, shown below, have unfamiliar keyboards which do not work normally. To understand how these are used visit the Calculator Keyboard Layouts page in the Calculator Technology section of this site. Since that time all ten-key calculators have had this arrangement of the keys. This reflected the order of the keys on full-keyboard machines, such as the Comptometer, where the "9" keys were at the top and the "1" keys at the bottom. However, the clipping on the left is from the December 1957 issue of the journal "Office Magazine". It shows a prototype of a key pad telephone from Bell Telephone Laboratories and points out "If the positioning of the top and bottom rows of figures were exchanged, operators of ten-key calculators would be in their element". 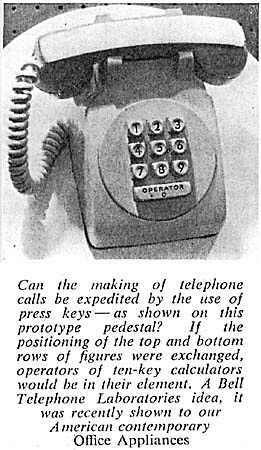 So it appears that the Bell Telephone Laboratories decided on an arrangement for telephones which was different to calculators, and all other key pad phones followed. Bell Labs, (inventor of touch-pad dialing) thought that the accountants of the world, having earlier mastered the calculator keypad, would cause errors in the slow electro-mechanical telephone number switching stations (exchanges), due to their speed on a calculator-style keyboard. The switching equipment was designed to operate in a rotary dial environment (some central office equipment is still backward compatible to accommodate those who still have rotary phones). With modern electronic switching "dialing" speed is no problem. They wanted typical new users of touch-pad phones, used to rotary dialling, to report that it saved time so the customer would eagerly pay extra for the feature, and for these the order of the numbers did not matter.